Small Fry Dance Club offers private preschool dance classes at locations throughout the Bay Area. We are an award winning extra curricular program. 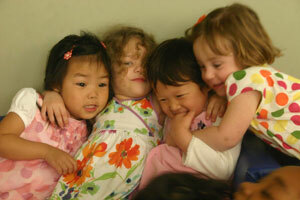 Our staff is highly trained, and we offer an age appropriate curriculum we have developed over the past 10 years. They are the same classes we offer at our studio in Foster City, we just bring the studio to you! The classes listed on this page are only for students enrolled at those centers. If you are looking for a public class, please visit our studio schedule page. Find your school listing and click on the “Register Now” button. Complete the form and a member of our staff will email you a confirmation. Your first class is automatically free. You will have a three day grace period to cancel after your trial without committment. If all goes well and you decide to continue, you’re all set! We will see you the week after your trial, and you will be officially enrolled after the three day grace period. Are you a preschool Director looking to bring SFDC to your school? If you are looking to add an award winning extra-curricular program to your school, please contact us! We would love to speak with you to see if we would be a good fit at your center. Call 650-393-5593 and ask for Jana or Carlos Chapeton. Or email info@smallfrydanceclub.com. Additional Notes: Register through Small Fry Dance Club website. Please include your child’s room name in the comment section of the registration form. Additional Notes: Due to construction at Belmont Oaks Academy we will only be starting the 3’s class in September. The 4’s class will return sometime in October. Stay tuned for updates.